Nature-based approach to Design solutions for a more resilient future aims to support societies address a variety of environmental, social and economic challenges in sustainable ways. This approach relies on actions that are inspired by, supported by or copied from Nature. Nature-based solutions use the features and complex system processes of nature, such as its ability to store carbon and regulate water flow, in order to achieve desired outcomes, such as reduced disaster risk, improved human well-being and socio-ecological inclusiveness. These nature-based solutions ideally are energy and resource-efficient, and resilient to change, but to be successful they must be adapted to local conditions. Nature-based Design recognises the importance of Nature and requires a systemic approach to environmental change based on an understanding of the structure and functioning of ecosystems, including human actions and their consequences. Nature-based solutions “sprout” from the premises that some societal challenges stem from human activities that have failed to recognize ecological limitations; and that sustainable alternatives to those activities can be found by looking to nature for design and process knowledge. They therefore involve the innovative application of knowledge about nature, inspired and supported by nature, and they maintain and enhance natural capital. They are positive responses to societal challenges, and can have the potential to simultaneously meet environmental, social and economic objectives. Directed to: PhD or MSc students in Biology, Environmental studies, Geography or related areas, and postdocs and other professionals working in related topics. 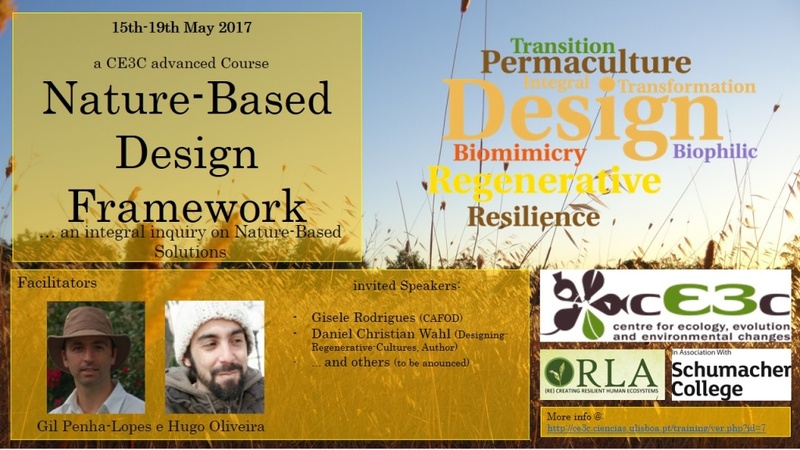 This course will introduce all participants to different Nature-based bodies of knowledge and experience, such as the Biomimicry, Permaculture and Resilience topics. With almost 2 days per topic, the students will get a good feeling of how these topics see, do research and implement effective and sustainable solutions targeting a wide variety of societal, ecological and economic challenges. Most of the learning sessions will be given at Museu Botânico so we benefit from natural and nature inspired man-made environments. A series of videos and documents will be sent to all participants prior to the course to be viewed/read before course attendance. Biomimicry (from bios, meaning life, and mimesis, meaning to imitate) is the practice of learning from nature to solve human problems and is emerging as a powerful tool for creating sustainable design and systemic transformation. Applied at a variety of scales, from individual products to buildings and organizations, biomimicry bring nature’s 3.8 billion years of innovation experience to the table. The core idea is that nature, imaginative by necessity, has already solved many of the problems we are grappling with. Animals, plants, and microbes are the consummate engineers. They have found what works, what is appropriate, and most important, what lasts here on Earth, following and promoting its’ Life Principles. The conscious emulation of life's genius is a survival strategy for the human race, a path to a sustainable future. According to Holmgren (2007) permaculture is presented as a design system of consciously designed landscapes trying to replicate patterns and relationships found in nature that simultaneously, produce abundance of food, fiber and fuel sufficiently providing local communities with their own needs. In this way both people, their settlements and the way they are organized are central issues in a permaculture design. 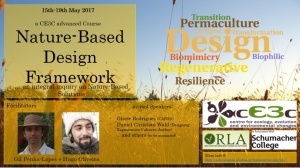 More precisely, permaculture as an ecological design system can be seen as the application of systems thinking to principles of design, by providing the conceptual framework for the planning and implementation of human settlements and ecosystems, aiming to provide their inhabitants with their needs, while increasing the natural capital for future generations. Permaculture is based on three ethical foundations that work as primal support for all permaculture design considerations: Care for the Earth, care for the people and redistribution of surplus (Mollison, 2002). Having the cornerstones of the ethical foundations, permaculture is then based on design principles that work as guidelines for the implementation of permaculture systems that look to provide for local needs. Being them design guidelines, they tend to promote innovation, creative application and local adaptation of strategies and techniques. Resilient design focuses on how to build capacity to deal with unexpected change. This approach moves beyond viewing people as external drivers of ecosystem dynamics and rather looks at how we are part of and interact with the biosphere – the sphere of air, water and land that surrounds the planet and in which all life is found. A resilience thinking approach tries to investigate how these interacting systems of people and nature – or social-ecological systems – can best be managed to ensure a sustainable and resilient supply of the essential ecosystem services on which humanity depends. Free for 1st year PhD students in the Doctoral programme in Biology (FCUL), Biodiversity, Genetics and Evolution (UL; UP), Biology and Ecology of Global Changes (UL, UA) and Climate Change and Sustainable Development Policies (UL, Univ. Nova); 25 € for PhD students from institutions of the PEERS network (cE3c, CFE); 125 € for FCUL Master students and unemployed; 180 € for BTI, BI and other PhD students; 250 € for Professional and postdocs. When the maximum number of students is reached 12 vacancies will be available for non-paying 1st year PhD students mentioned above, being, by order of preference: 1) cE3c students; 2) Climate Change and Sustainable Development Policies (not from cE3c); 3) BIODIV students (not from cE3c); 4) FCUL students (not from cE3c); 5) BEAG students (not from FCUL).